Now with Adobe onboard to push updates the second Tuesday of the month, Patch Tuesdays have become even more fun. Microsoft deployed seven security bulletins while Adobe released updates yesterday to Adobe Flash Player, Acrobat and Reader, and Adobe AIR. The Adobe Acrobat and Reader updates released included support for versions 9, 10, and 11. On top of that, Mozilla released Firefox 18 to the web yesterday. 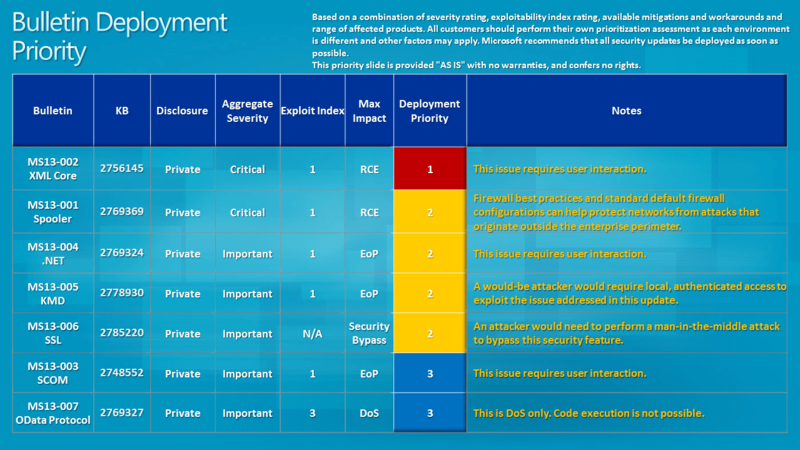 For more details, you can read the Microsoft Security Bulletin Summary for January 2013 or the MSRC blog on the bulletin release. Adobe released two security bulletins yesterday. The current versions of Adobe Reader and Acrobat are: 11.0.1, 10.1.5, and 9.5.3. Versions on Windows, Macintosh, and Linux were all affected by this patch and are encouraged to update to the latest version. For more details, consult the Adobe Reader and Acrobat Security Bulletin. Flash Player version numbers are considerably more messy. Users of Adobe Flash Player 11.5.502.135 and earlier versions for Windows should update to Adobe Flash Player 11.5.502.146. Users of Adobe Flash Player 11.5.502.136 and earlier versions for Macintosh should update to Adobe Flash Player 11.5.502.146. Users of Adobe Flash Player 11.2.202.258 and earlier versions for Linux should update to Adobe Flash Player 11.2.202.261. Flash Player installed with Google Chrome will automatically be updated to the latest Google Chrome version, which will include Adobe Flash Player 11.5.31.137 for Windows, Macintosh and Linux. Flash Player installed with Internet Explorer 10 for Windows 8 will automatically be updated to the latest Internet Explorer 10 version, which will include Adobe Flash Player 11.3.378.5 for Windows. Users of Adobe Flash Player 11.1.115.34 and earlier versions on Android 4.x devices should update to Adobe Flash Player 11.1.115.36. Users of Adobe Flash Player 11.1.111.29 and earlier versions for Android 3.x and earlier versions should update to Flash Player 11.1.111.31. Adobe AIR is a little better off with Windows and Macintosh recommended to update to 3.5.0.1060. The same version is also used for the AIR SDK, which includes AIR for iOS. For more details, consult the Adobe Flash Player Security Bulletin.